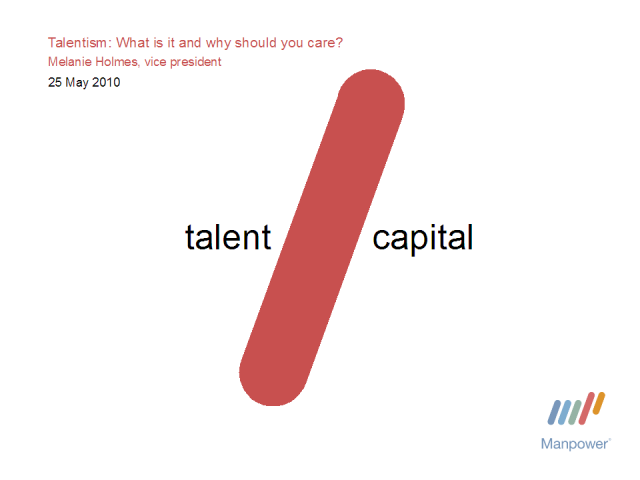 Talentism: What is it and why should you care? The world and the world of work are changing – globalization, technology, demographics, the economic downturn. No matter the size and scope of your organization, these fundamental issues affect your business. So how can you weather these changes and emerge a stronger company? One key component to success is your talent. - Why companies with the best talent will be the ones who win. - The talent-related implications of key world of work trends. - Tips on finding, attracting, engaging and retaining talent. The world of work is being reconfigured – it is time to prepare for the new normal. Melanie Holmes, VP of World of Work Solutions, Manpower Inc. Title: Talentism: What is it and why should you care? Presented by: Melanie Holmes, VP of World of Work Solutions, Manpower Inc.